We are still living on the boat at the marina in Summerside and now that the weather has warmed up, it is much better. I did buy a set of fleece sheets and they have made a big difference. I think I will keep them on all summer while we’re on the boat. Cotton just seems to absorb all the moisture whereas these fleece sheets do not. Now, they are shedding quite a bit even though I washed and dried them on extra hot, so maybe a few more washes might do the trick. I would recommend them, so here is the link. We spent Canada Day here in Summerside and it was quite nice. There were activities for the kids down at the Green Shores Park which is about a kilometre away if you walk on the boardwalk. There were quite a few bouncy castles and I wondered if they were tied down enough due to the continual winds here on the island, but nothing went wrong, so I guess they were fine. The fireworks were really good, especially because we just sat out on our deck. There were all sorts of people on the boardwalk and the dock and everyone looked like they were having fun. Allan, from the computer store next door kept us well entertained with his nine grandchildren. They all seemed to have to use the washroom and none at the same time, so he spent most of the night walking back and forth with a different child in tow every few minutes. It was pretty funny! The house is progressing well and William has the windows all done as well as most of the trim. Next week will be a big week as Chris will be working on tiling the floors and the kitchen is coming on Wednesday. Most of the lights were installed on Thursday and they look really nice. Other than that, we went for a bike ride today to Kensington. We stopped at all the antique stores along the way. There is so much stuff! I really like the antique wooden crates so I might get one later on. It is a good idea to ride your bike though while shopping for antiques because you can’t carry much. 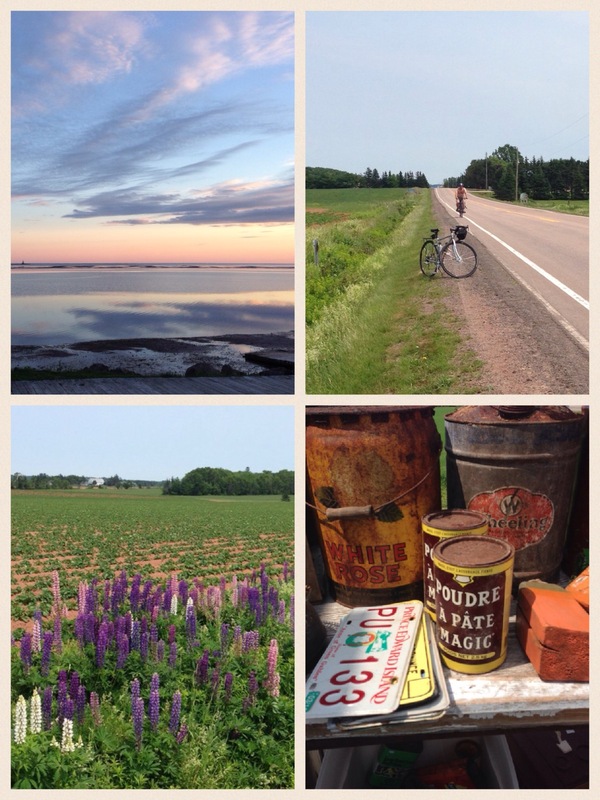 Here are some pictures of last night’s sunset and our bike ride. That’s about all the news for today. Glad the weather has warmed up! 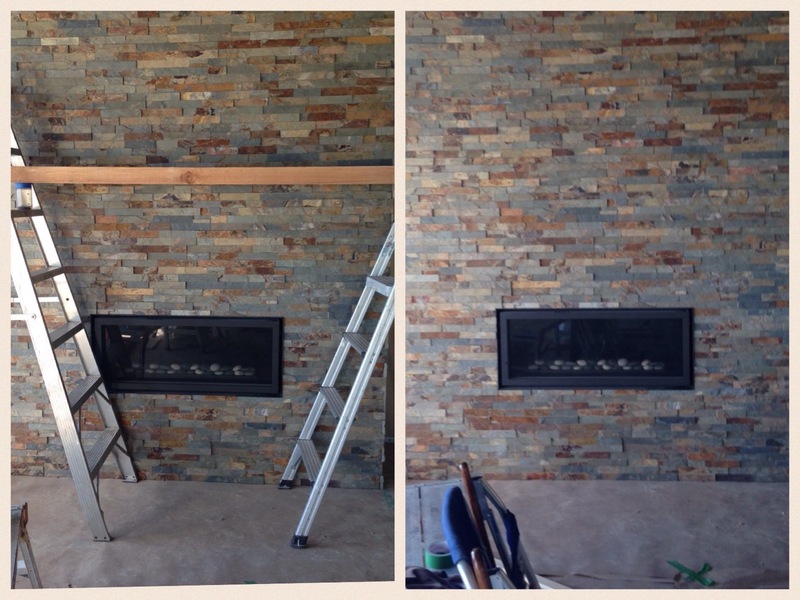 I like the mantle, sans the ladders unless you are looking for a steam punk look. I would say … Go with the mantle since it breaks up all of the brick look and would allow you to decorate it with bobbles that you like to display. It can’t be just all about the brick! There is your fashion tip from Ernie (unlicensed interior design critic). You’ve gotta have a mantle–what else are gonna dust? Enjoying your photos! I like the mantle, too. Oddly, it seems to draw the eye to the stonework (which is beautiful).